I am certain that as long as Christ is not the focus of our lives, we will never accomplish what we have been born to do. HE can’t just be Savior without being our Lord! We must keep Him on the throne of our hearts every day. It is a new decision every day..do I put myself on the throne and ignore Him in my decisions or do I allow Him to rule my heart. Too often we want to live our Christian walk as spectators. Nowhere in the Bible did the disciples and followers have that as an option and still live a life that pleased the Lord. The Word of God is full of just how important it is that we follow, not observe, not sit back and enjoy, but follow our beautiful King…whenever and wherever He leads us! We must be prepared to lay aside anything that is keeping us from following Him. That may be a habit, laziness, idleness, lack in our prayer life, lack in our reading the Word, anything! Matthew 16:24-27 24 Then Jesus said to his disciples, “Whoever wants to be my disciple must deny themselves and take up their cross and follow me. 25 For whoever wants to save their life will lose it, but whoever loses their life for me will find it.26 What good will it be for someone to gain the whole world, yet forfeit their soul? Or what can anyone give in exchange for their soul? 27 For the Son of Man is going to come in his Father’s glory with his angels, and then he will reward each person according to what they have done. Matthew 10:37-3937 “Anyone who loves their father or mother more than me is not worthy of me; anyone who loves their son or daughter more than me is not worthy of me.38 Whoever does not take up their cross and follow me is not worthy of me.39 Whoever finds their life will lose it, and whoever loses their life for my sake will find it. John 13:12-1712 When he had finished washing their feet, he put on his clothes and returned to his place. “Do you understand what I have done for you?” he asked them.13 “You call me ‘Teacher’ and ‘Lord,’ and rightly so, for that is what I am. 14 Now that I, your Lord and Teacher, have washed your feet, you also should wash one another’s feet. 15 I have set you an example that you should do as I have done for you. 16 Very truly I tell you, no servant is greater than his master, nor is a messenger greater than the one who sent him. 17 Now that you know these things, you will be blessed if you do them. All of these verses require action on our part. 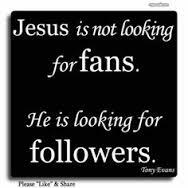 Not spectating but active involvement in following our leader, Jesus Christ. It is so critically important that we don’t get too comfy in our pews and watch others serve Christ. Rather, we need to daily ask God for direction in how we can best serve Him! We are living in a world where there is hurt, suffering, poverty and pain just about everywhere you look. There is no shortage of places to serve. Let each one of us daily ask where we can be used. ← It’s the SAME Spirit!